Those are among the keys to finding the best financing for your next vehicle purchase, according to the U.S. Consumer Financial Protection Bureau (CFPB). “As soon as you know your budget, shop around … Comparing offers will help you get the loan that’s right for you,” says the CFPB in Learn to explore loan choices on its website. Buy-here-pay-here dealerships may offer financing, but interest rates can be higher, says the CFPB. “Even if you have poor or no credit, it may be worth seeing if there is a bank, credit union, other lender or another dealer that is willing to make a loan to you,” the CFPB suggests. The preapproval will provide a loan quote with an interest rate, loan length and maximum loan amount based on factors such as your creditworthiness, terms of the loan and type of vehicle, says the CFPB. This allows you to compare different lenders’ offers, which also may be negotiable. To help you along, the CFPB offers a 16-step auto loan shopping worksheet, Comparing auto loans, which also highlights seven factors that you can negotiate. But won’t shopping around for the best vehicle financing affect your credit score(s)? Not much, according to the consumer protection bureau. 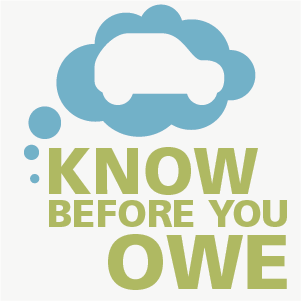 It’s another good reason to know before you owe.